Kauai, Hawaii is pure paradise found in the United States and an absolutely wonderful destination for families! 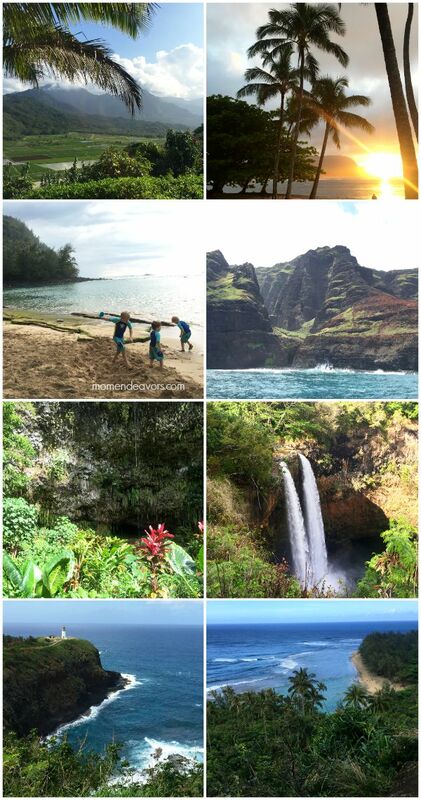 Natural beauty abounds – amazing waterfalls, the incredible cliffs of the Napali Coast, Waimea Canyon (the Grand Canyon of the Pacific), beautiful beaches, and more! There’s a reason Kauai’s nickname is The Garden Isle. Breathtaking! Clearly, there’s no shortage of lush, amazing scenery and activities! We highly recommend it for a family vacation. If you’re like me though, one of the hardest things about vacation planning is researching and deciding what hotel(s) to stay at. 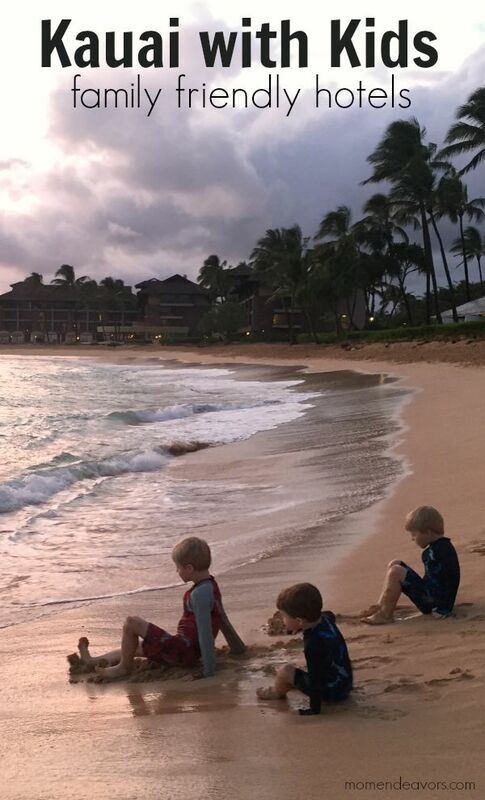 We ended up staying at three family-friendly resorts in Kauai – one on each side of the island, making it really convenient for sight-seeing in the area without spending too much time in the car. Each hotel has its own set of pros & cons, but all the properties were all beautiful and we would definitely consider staying at any one of them again. Kauai’s North Shore is definitely the most lush of the 3 major inhabited sides of the island. It also has least commercial and off-the-beaten path feel. Families looking to connect with nature and who want some of the most incredible views on the island will LOVE staying up here. 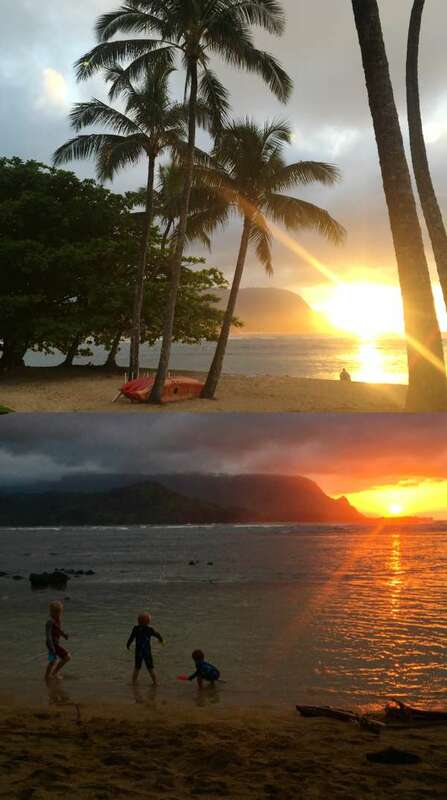 We stayed at the Hanalei Bay Resort, the views from which really canNOT be beat! Look at those grounds! And the mountain views- spectacular!! The photos really barely even begin to capture it. This is true paradise in absolutely ever sense of the word! Just check out the walk down to our room and the view from our lanai: Aside from the incredible views and location, what makes the Hanalei Bay Resort a nice pick for families are the condo style units. The one- or two-bedroom condo units are equipped with full kitchens, allowing families to save money by cooking in their room (or at one of the BBQ grilling areas available on property). Plus, the condo-style rooms provide a much more “at-home” feel which can be especially nice when traveling with young kids. Here’s a peek into our two-bedroom condo unit (it was SO spacious and with little kids, I LOVE that it was one story): So nice! We could have happily moved in there! 😉 And we can’t leave out the pool area here – Amazing!!! The pool truly feels like tropical paradise. The kids loved playing in the shallow beach area! If you want beach time, you can walk down (or call for a golf cart ride) down the beach path to Hanalei Bay. We spent a beautiful evening there playing in the water and watching the sunset. The beach is not private, but only shared with one other hotel and a little difficult for locals to get to. It’s a GREAT beach for the kids to play on! So the Hanalei Bay Resort is a GREAT choice for families wanting a condo-style accommodations and are looking to do activities on Kauai’s lush North Shore (which I highly recommend). The Resort is less than a 20-minute drive from most of the best & most scenic beaches on the island. For more details on the hotel, you can read our comprehensive Hanalei Bay Resort review here on Family Vacation Critic. 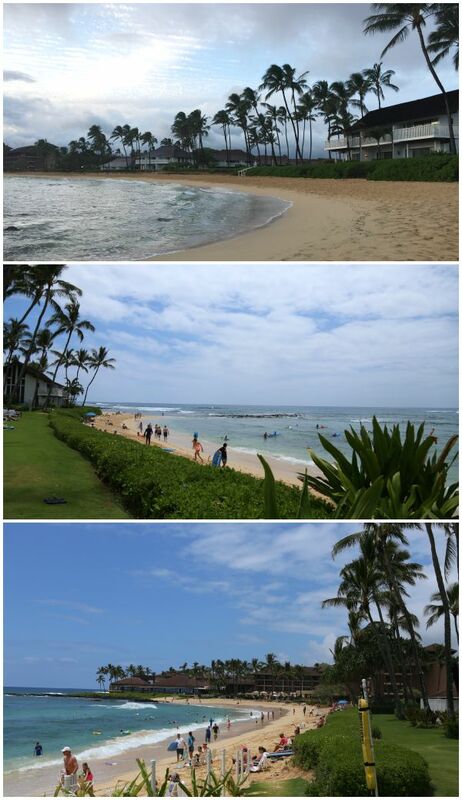 We also spent two nights at the Kauai Beach Resort (an Aqua Hotel Property), centrally located on Kauai’s eastern side. At just a few minutes away from the airport, this is a really convenient option! And for families who want a more traditional hotel experience (instead of condo-style), the Kauai Beach Resort is a great choice. You feel completely immersed in all-things Hawaiian paradise from the moment you step on the grounds! We had a one bedroom suite with a king bed in the bedroom and a pull-out sofa sleeper in the living area. As a young family of 5, the space was perfect for us. 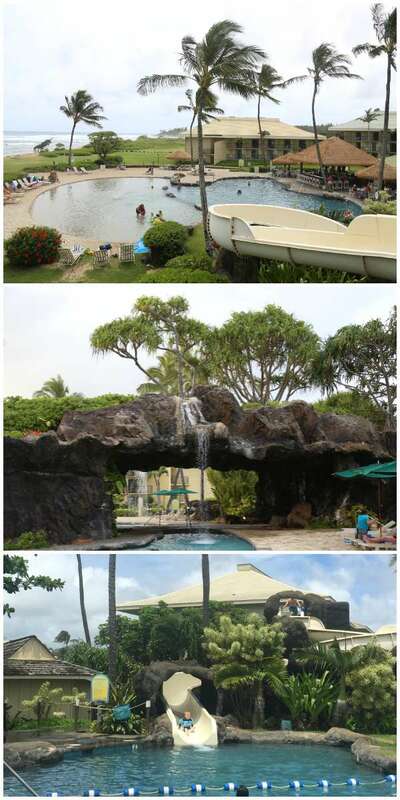 The BIG win at the Kauai Beach Resort though is the pool area! It’s HUGE!! With multiple pools, hot tubs, waterfalls, and even a water slide – this is a fantastic feature of this property. The sand bottom pool is right off the beach, so you can enjoy the sounds of the waves while lounging by the pool! Totally awesome! I love that view from the top of the water slide (which shows the close proximity to the beach and only half of the awesome pools on property). As opposed to the condo-style room vacation, a perk about staying at a resort like the Kauai Beach Resort is having multiple restaurant locations on property. 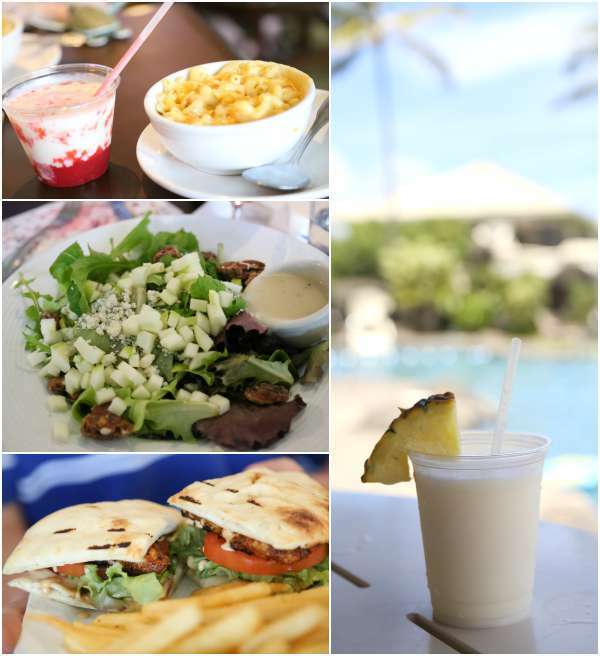 We dined poolside one day and tried out one of the restaurants. Everyone found something tasty to eat, so we were happy with the food quality & choices! So, for families wanting a convenient central location to call home in Kauai, we highly recommend the Kauai Beach Resort! You’re not more than a 30 minute drive in either direction from some of Kauai’s best beaches! For more specific details on this property, be sure to read our detailed Kauai Beach Resort review on Family Vacation Critic! Kauai’s south shore is a very popular tourist destination. While typically much drier and not nearly as lush as the north shore, there is no shortage of great beaches and things to do on Kauai’s southern end. The Outrigger Kiahuna Plantation is conveniently located on a stretch of the ever-popular Poipu Beach and right near to a HUGE variety of restaurants and shops! We loved being able to walk right across the street to do a shopping and get a tasty Puka Dog! And, less than a 5 minute drive away was another large shopping center (plus tourist destinations like Spouting Horn, the National Botanical Gardens, etc). 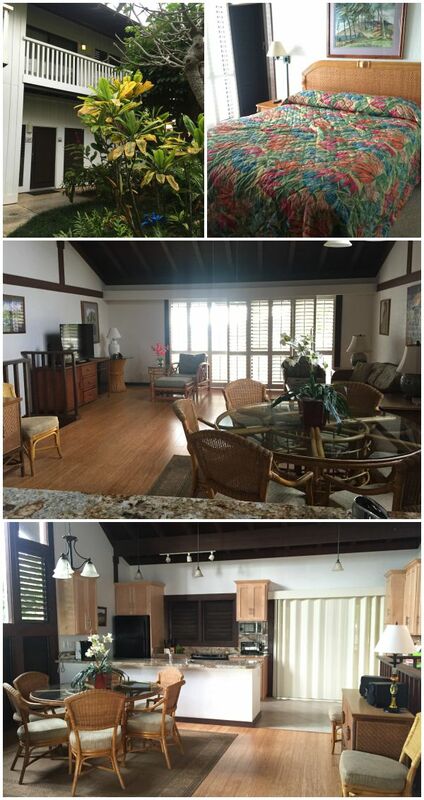 The Outrigger Kiahuna Plantation is a condominium collection property – so you have the comforts of home away from home. 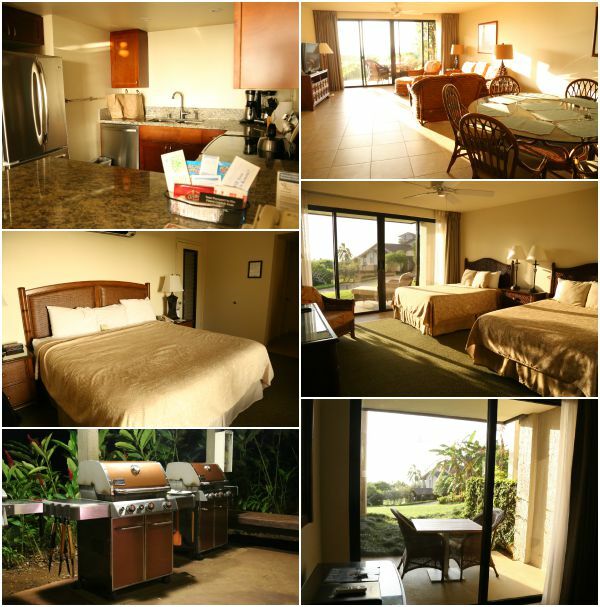 Our Poipu condo was two-story with two bedrooms, two bathrooms, a balcony, and great living space/kitchen area. We only stayed 2 nights, but it would have definitely been roomy enough to spend a week in. Just like the other two properties, the grounds here were quiet lovely and well-kept. The flowers were gorgeous and there were SO many palm trees! One down-side is that there is no pool on property (though you do have access to the Athletic Club’s pool across the street). But, the property does sit on a very family-friendly beach! The stretch of Poipu Beach right here was great or you can drive just down the road to Poipu Beach Park. Our boys loved Poipu Beach Park! So families looking for condo-style accommodations on Kauai’s popular south shore should definitely consider the Outrigger Kiahuna Plantation. For more information about the property, be sure to read through our detailed Outrigger Kiahuna Plantation review on Family Vacation Critic! Really you can’t go wrong with any of the three properties! We could have easily enjoyed staying for the whole week at any of them! There were different special features that we really liked about all of them, so it really comes down to budget, location, and personal preferences! What kind of accommodations and amenities are your “musts” for family travel? Disclosure: This post is part of a press trip with the Kauai Visitors Bureau, in which accommodations, some travel & activities were provided. All opinions, experiences, and photographs are entirely our own. Wow. JUST. WOW. Bucket list experience, for sure. Thanks for sharing!!!! Makes me want to visit Hawaii again! What an amazing trip! This looks beautiful and I can’t wait to travel there in just a few months. The Hanalei Bay Resort looks like a great option for our family! Our older daughter was just six months old the last time we were in Hawaii seven years ago; it’s definitely time for another visit.